I finally got a sliding barn door in my house! I'm so excited, can you tell? 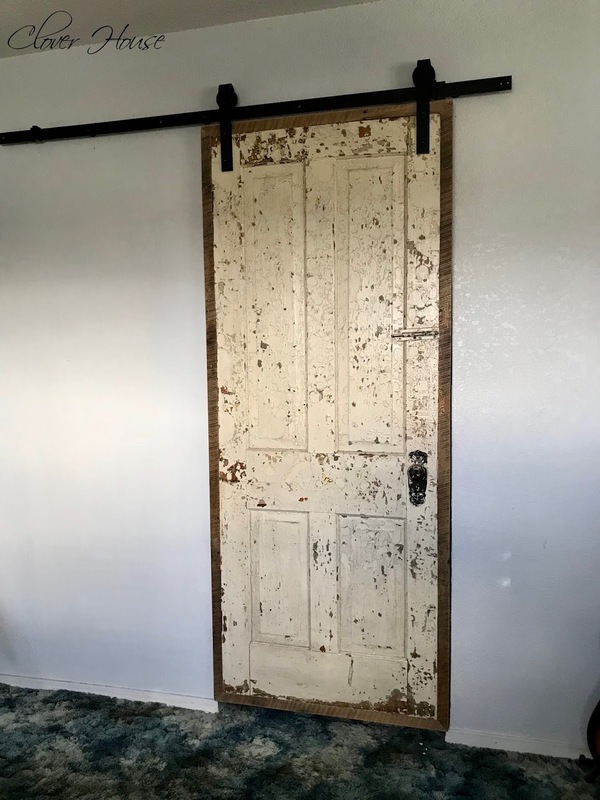 I knew I wanted a barn door in our bedroom because the door way to our bathroom does not have a door. It really doesn't bother us not having a door, but to me it was the perfect place for the sliding barn door. We have had this door for years just standing in the shop waiting patiently to be inside our home. Every now again we decide to do a little project in our home so this is what we came up with for our most recent idea. Let me start off by saying that my sweet honey bun was not feeling well at all but he totally insisted on getting this project done for me. He's the best! 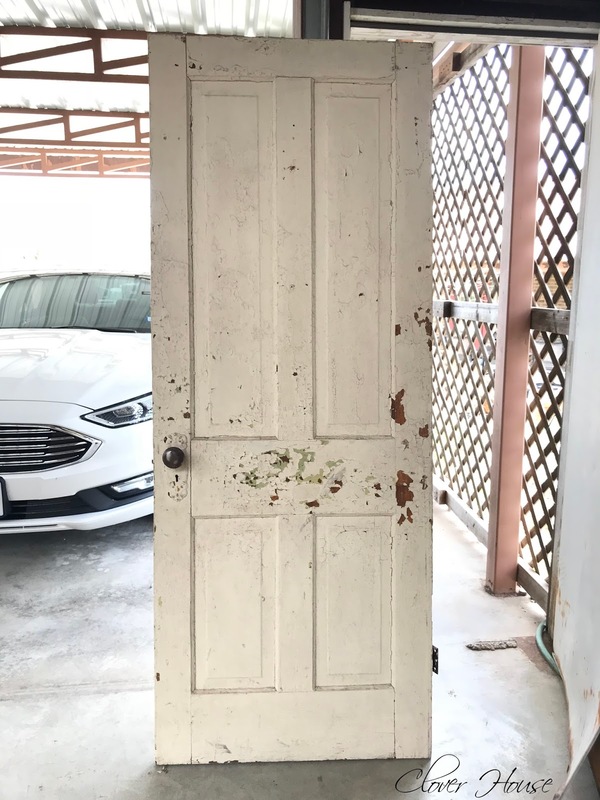 This is the old door before we got started. No telling how many layers of paint it had on it but I bet it could tell some stories if it could talk. Just look at all that chippy goodness she's got going on there and that door knob and plate, so yummy! I love it all! PS, it looks white here, but its really a yellowish color. 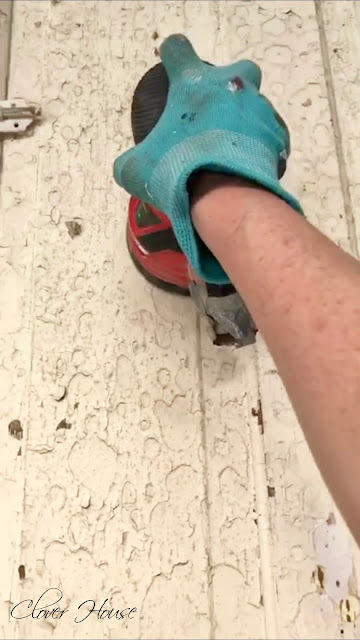 NOTE: Please use a mask and gloves when sanding to help protect you from possible lead paint particles. First I used my little whisk broom to knock off all the large chips, the dust and cob webs that had built up on it while it was standing and waiting. Then I used my rotary sander and some 220 grit sand paper to knock off all of the big pieces of chippiness. Lastly I gave it a good dusting with the air compressor and then wiped it down with some soapy water and let it dry real good. The door wasn't quite wide enough to cover our opening, so we had to add a frame to it to make it fit better. 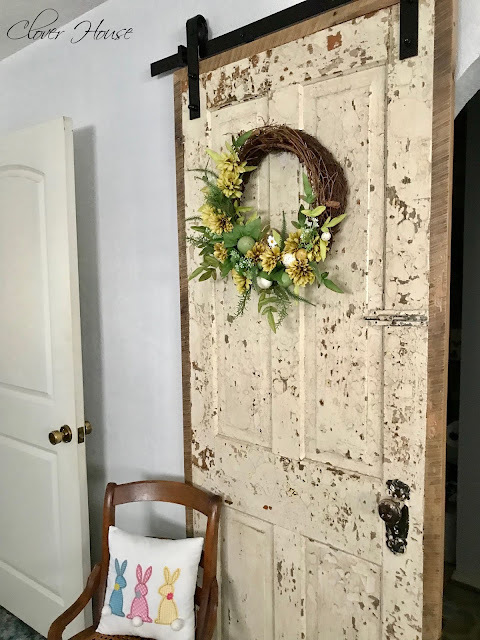 We picked out some of our treasured barn wood like we used for this project and also this one, to create the frame around the door. 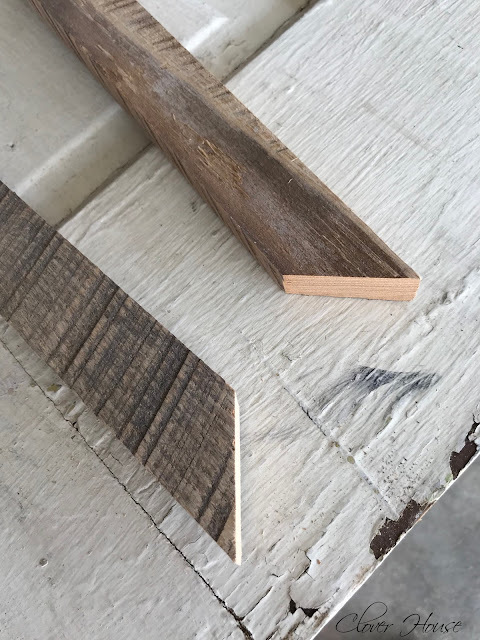 It's pretty much like making a picture frame using the chop saw my honey cut each corner at a 45 degree angle. 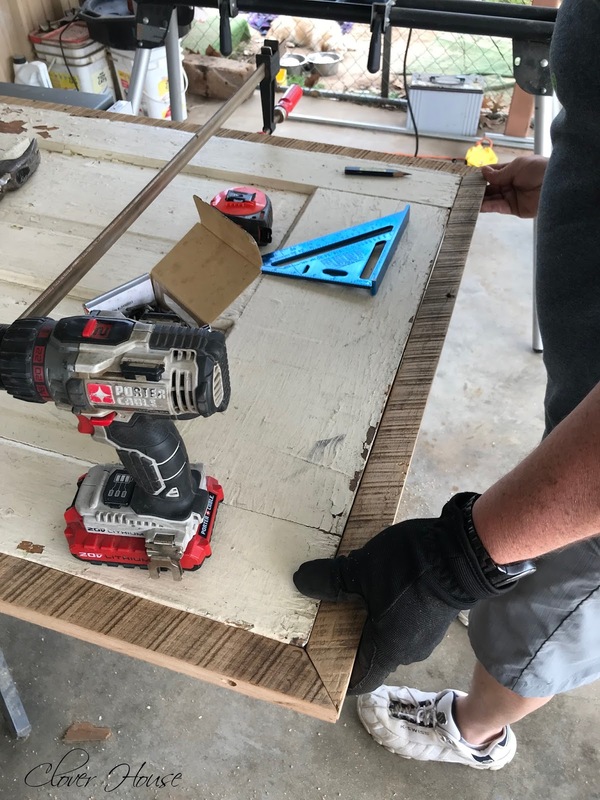 After all the pieces were cut to fit, he created pocket holes using his drill and our Kreg Jig Jr. to make the screw holes so that the screws wouldn't show in the final project. 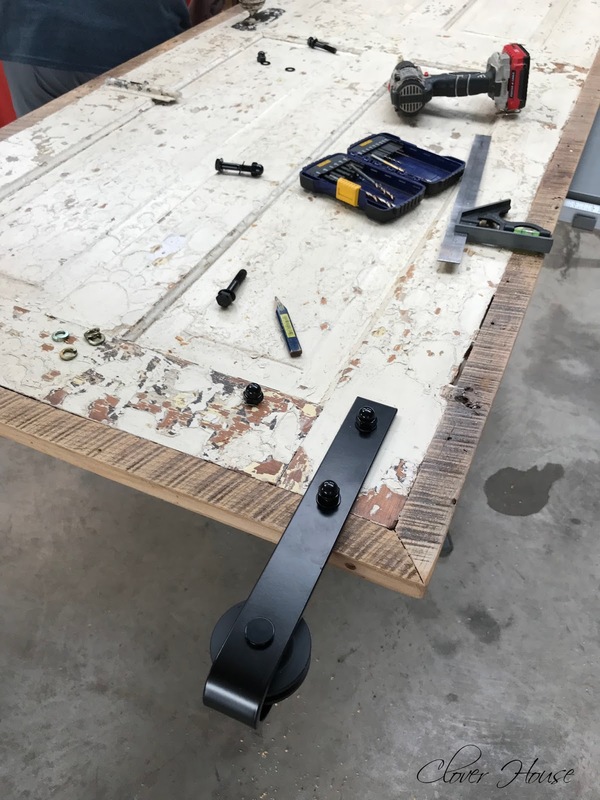 We used 2" long screws to attached the frame pieces to the door all the way around. To help hold the frame pieces in place while placing the screws, my honey used an adjustable woodworking clamp to hold the frame together so it would stay straight while he got all the screws tightened down. After the frame was in place, I used a water based, non-yellowing clear protector to seal all the chips into place. I wanted to preserve that gorgeous chippy look I had. Normally I use a foam brush to apply this sealer, but this time I used an old cheap 3" brush to apply the sealer because the surface was extremely rough and the foam brush wouldn't have lasted five strokes in. After I slathered on a good thick coat of sealer, I let each side dry for a good 30 minutes before we applied the sliding door hardware. We used an Everbilt Decorative Sliding Door Hardware Kit to hang our door, but I found this one right here that is even cheaper than the one we got. Now on to installing the hardware to the door. Make sure you read the directions at least twice! 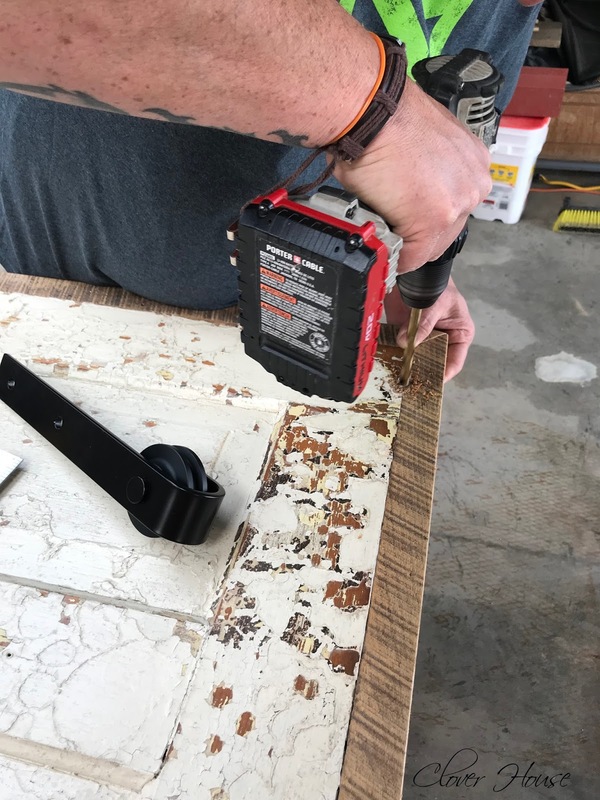 Its the equivalent to "measure twice, cut once". 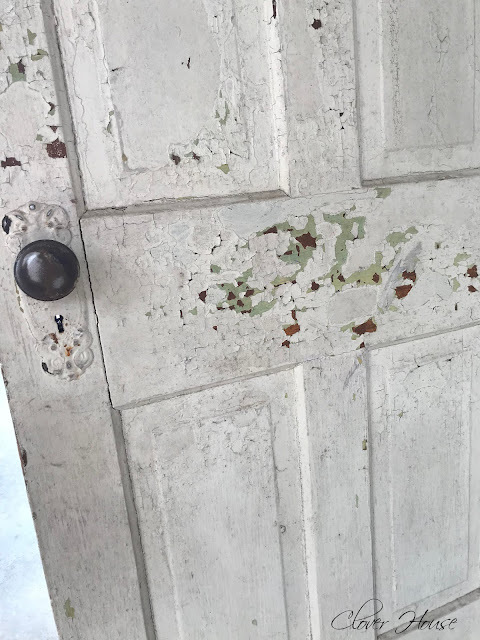 You really want to make sure you're doing everything right so you don't ruin your door! First, drill the holes for your bolts. See that sliding, leveling ruler there? It is your friend, you need it for this job. Everything has to be just right to make your door function properly. Install the bolt and washers along with the slider pulley thingy...that's the technical term for it! :) We ended up using extra washers to take up space because the bolts were a tad bit to long for our door thickness. No worries, the kit had extras just in case of that problem right there! The hanging bar comes with the holes pre-drilled. 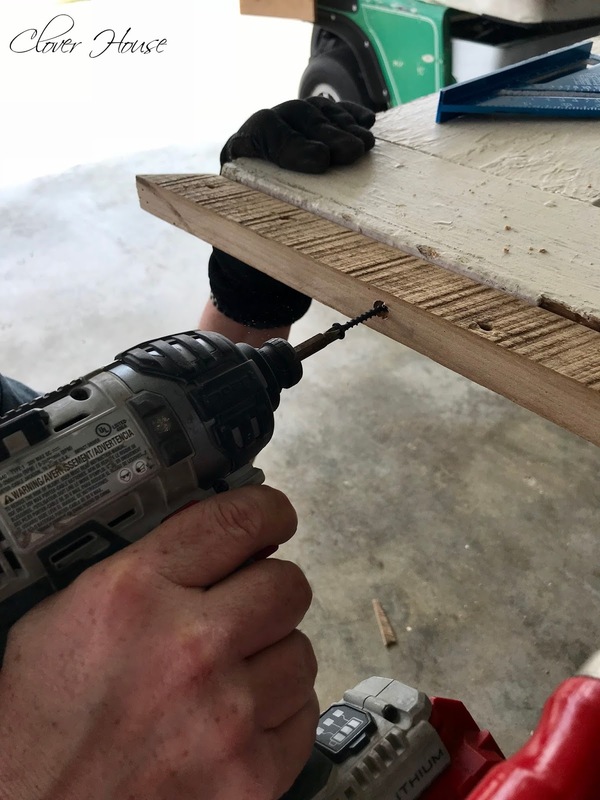 Our house is old and weird and we ended up needing to drill extra holes to match our studs. Hopefully you won't have to do that step. 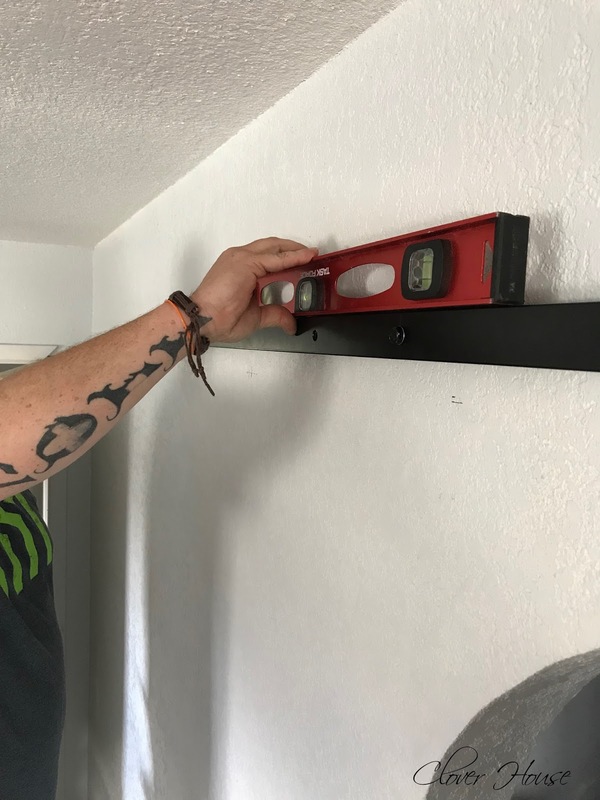 You must use a long level to make sure you're installing a level bar, otherwise, your door will not operate properly. HIM: "I'm sorry baby, but that thing is ugly." ME: Oh no! Really, do you think so? HIM: Yeah, I just don't care for it. ME: Well, I love it, maybe it'll grow on you? ME: Ok, take it down and we'll start over. HIM: No! I'm sure it'll grow on me. Of course this little project has prompted me to do like five more projects, so my list of things to do grows longer! Want to see how I made that pretty wreath? Just click right here. Like get rid of this 1980's carpet and linoleum that's still in here in our master bedroom and bathroom! Gosh! If you want to see what all we've done in the bathroom so far, I made some clickable links down below. 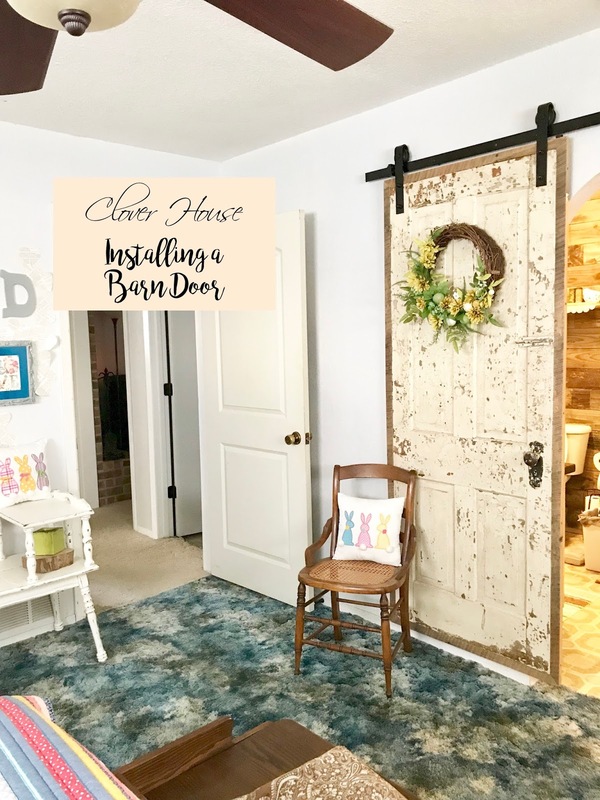 Have you ever installed a sliding barn door? 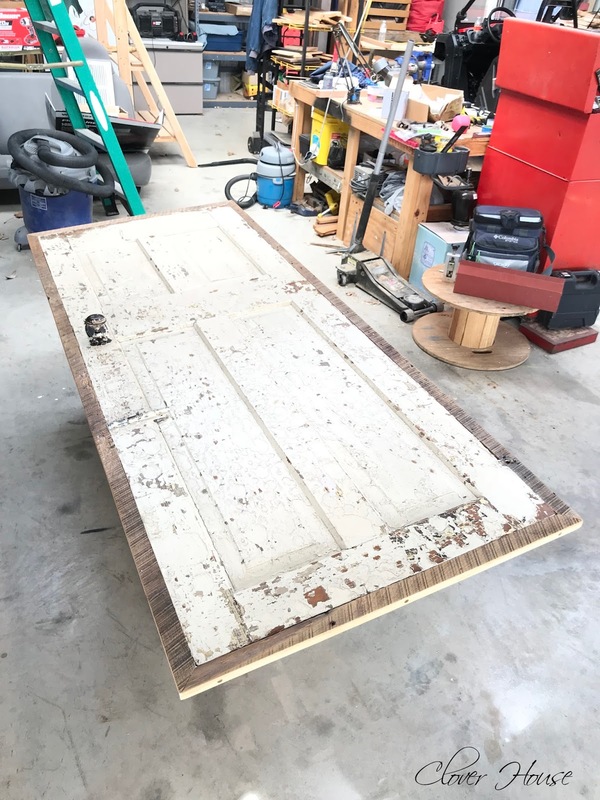 Did you use a vintage door or build your own? Let me know in the comments down below. Check out my Farm House Decor board on Pinterest for more farmhouse decorating ideas and please give me a follow if you're not already following. FANTASTIC! We didn't have a door on our potty stall in our master bath. 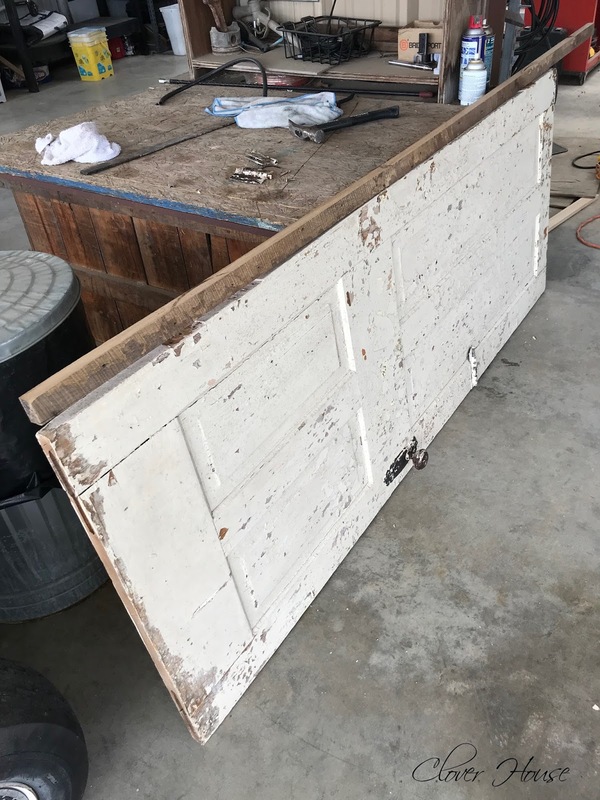 Used an old door and hung it up to slide. But, it's inside the room instead of being on the outside wall. I have the hardware for another sliding door, we are going to put it in front of our shower stall in our master bath. Both of these sections of the master bathroom were built not to have doors, but I have decided I wanted the sliding doors. Love your's. Hope your sweetie is better now. 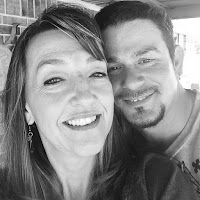 It's so nice having hubby's who can do our projects. Great job. Hi there! Thanks so much and yes it is nice to have a hubby that can do all these projects and I guess its normal for the builders not to add doors to bathrooms!?!! Wow that is a beauty. I think the addition of the frame adds so much to the overall look. And of course these are super practical in that they take up very little space. Enjoy all that chippy goodness! !